You are here: HomenextPeoplenextPeople (General)nextLIONEL LANE 1935 to 1943, 1947 to 1982. Progress Manager. How it all started, cycling to work, wages, first impressions, WW2. Sporting activities. Army experiences, returning to work, sad moments, opinions of management and workforce, memories of the Gloucester area. Lionel heard about F & P from his father. He attended an interview conducted by a Mr George Collingbourne and was taken on. He first worked under Mr Bill Meadows, the then Progress Manager and was made responsible for getting finished machined items into the fitting Shops as required. He cycled to work and back from Churcham and remembers drying his clothes in the Brass Foundry on wet days. Those travelling by car numbered six only, mostly directors, everyone else walking or cycling. Lionel names the other factories in the area and remarks on the mayhem caused on the roads at the end of the working day! He talks about the ‘clocking in’ procedure and what happened on one of the occasions he was late! Lionel remembers his first wage of 8/6d and compares it with those of the skilled workers. On entering the factory for the first time he was overawed by all the belt-driven machinery and explains what apprentices did to brings thing to a halt on very hot days. With 1939 and WW2 approaching, Lionel mentions the type of equipment being manufactured, women being employed in the factory for the very first time, Fred Roach being the only First Aider on the premises and Lance Pitt being in charge of security. The factory received no bomb damage. Lionel talks of sporting activities that took place during wartime and goes on to tell of his departure to join the ‘Gloucesters’. He gives a detailed account of the places he visited, at home and abroad. He was ‘demobbed’ in Basra then goes on to describe the long journey back to the UK. In Leeds he was fitted out with civilian clothes. Lionel found Gloucester very quiet compared with the previous few years but, after a long leave he returned to F & P to work in the same capacity as before. Lionel had no specific finest achievements but had great satisfaction in ensuring components arrived at the right place at the right time, which he did over a long period of time. His saddest moment came when he had to tell a fitter that he was to be made redundant. Lionel then gives his opinions of the senior management of the day and goes on to talk in glowing terms of the workforce. Lionel was made redundant in 1982 at the age of 64. When asked if there was anything else he would like to add, Lionel talked in some detail of activities and places he remembers from his early days in the area. 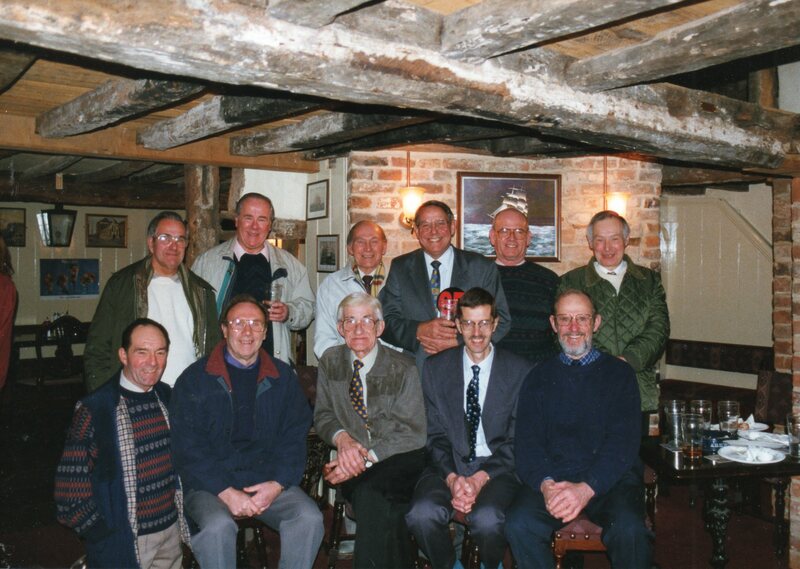 Back row L-R: John Ansley; Clarence Hack; LIONEL LANE; George Claridge; Norman Davenport; Brian Billingham. Front row L-R: Lionel Longney; Ken Daniell; Sid Jenkins; Tim Lodge; John Davis. If you remember Lionel or any of the people or places he mentions, then please share those memories by clicking on the words Add a comment about this page. George Collingbourne was my maternal grandfather. I believe he was an estimator with F & P, he worked there until he retired around late 40s early 50s. We watched the Coronation on the television he was given as a retirement present!! I was six at the time. It seems that he was also Hon. Sec. for the F & P Athletics Club. 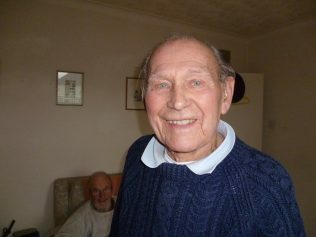 He was a very keen angler, and played rugby and cricket in his younger years. He had four daughters.